The month of November was packed with releases of Korean films. There were roughly 2, sometimes 3, movies that came out each week. Add the releases of prevalent Hollywood films such as <Bohemian Rhapsody> and <Fantastic Beasts: The Crimes of Grindelwald> to the mix and there were intensive competition amongst the movies, and too little of time (and money) to watch for myself, to keep up with every single release. However, I tried, and am trying, to stay up-to-date and watch as much of the big Kfilms that are coming out. That being said, with the limited time and money I can invest in going out to the theaters, I must choose wisely the films I decide to watch. And I cannot say that <Happy Together> was a smart choice. Allow me to explain. Directed by Kim Jung-Hwan, <Happy Together> features Park Sung-Woon, Song Sae-Byeok, Choi Ro-Un, Hyuk from the Kpop group VIXX, and Kwon Hae-Hyo. Judging from the lineup, it’s not the best, but it’s not the worst either. Park Sung-Woon is a proven actor, being in hit-films such as <New World> (one of my all-time favorite Korean movies), and more recently <The Great Battle> and <Monstrum>. Kwon Hae-Hyo starred in numerous Kdramas and Kfilms as both the main and supporting cast member. On the other hand, there were new faces that were to showcase their talents and prove their positions in the movie entertainment industry, including a common Kpop-idol-gone-acting one (Hyuk). I didn’t have high expectations of the film, seeing as the trailer didn’t really have much going for itself, but went into the theater with an optimistic outlook. However, I couldn’t have been more disappointed… The film was one of the cheesiest, cringe-filled, tear-jerking movies I’ve seen lately (that’s saying a lot, even with <The Wrath> and <Too Hot to Die> being reviewed recently), and I wanted to leave the theater midway through. The story itself isn’t too bad; the narrative is a touching one about the relationship of a father and son and their love for music, specifically the saxophone (this is an overly simplified summary). But the execution… oh man… I cannot understand at all how this has the rating it currently does… (basically 8/10 on most sites). 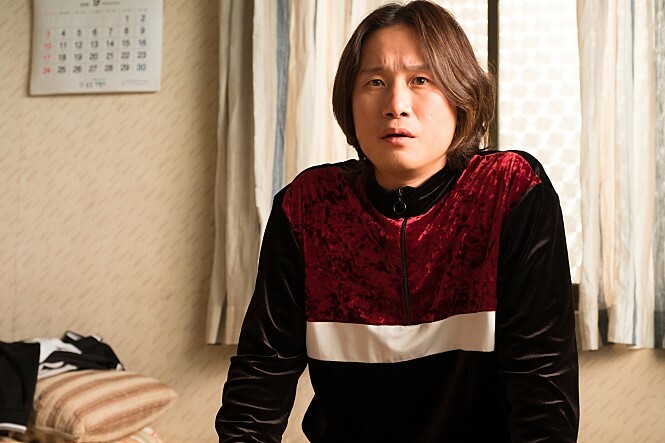 Kang Seok-Jin (Park Sung-Woong) only lives for one thing: his son, Haneul (Choi Ro-Un). After pursuing years of music that led to nothing but a poor, unsatisfying life, he gives up his passion in order to provide a better life for his son. Before sacrificing his love for music, specifically the saxophone, he worked at a nightclub as a saxophone performer, receiving the minimum payment that wasn’t even enough to get him and his son by day-to-day. 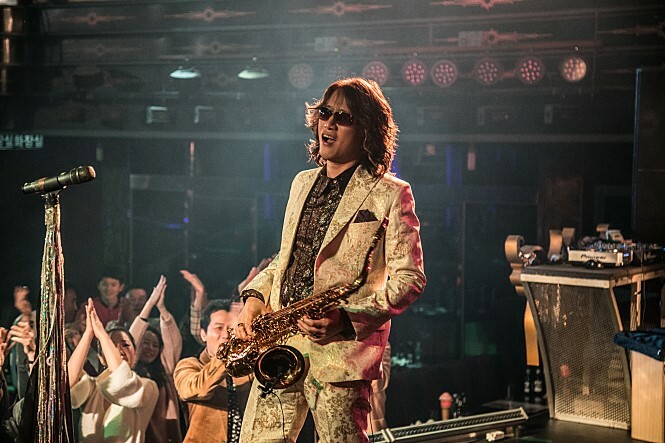 It was at this nightclub that he met Park Young-Gul (Song Sae-Byeok), a rival saxophone player. However, the two meet again in the least expected way at the least expected place. The drama between Kang Seok-Jin, his son, and Park Youg-Gul begins! 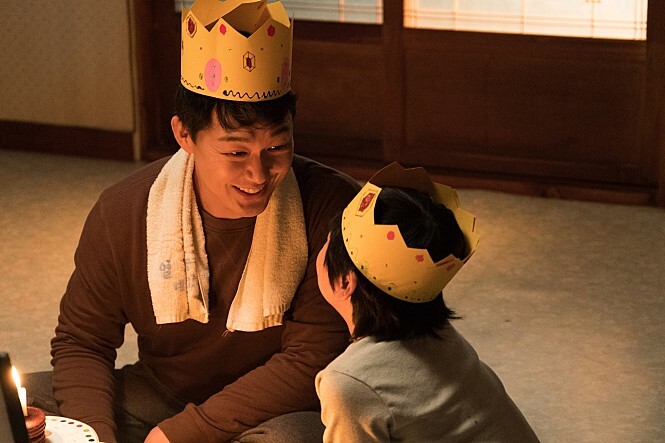 In spite of all the negative remarks I have to say about <Happy Together>, there is one definite positive aspect of the film: The acting by the child actor Choi Ro-Un. I hadn’t seen him in other productions, but his acting in this was phenomenal. It’s almost unbelievable that such a young boy possesses the incredible talent that he does. He’s able to connect with the audience on an emotional level as much as, and even better than some, adult actors. It almost felt as if the movie was made just to show his true potential. It revolved around him and his ability to engage in an emotionally-driven story. Definitely someone to watch and look out for. As for the other cast members, nothing too special, and even bad performances from some. In addition, the overall storyline was a touching one. Although there are a lot of elements that I highly disliked, the general narrative and idea was decent. However, as I will mention in the next section, the execution was incredibly cringe. Maybe (probably) because I’m just not into films like this, I didn’t enjoy it. There are a lot of positive reviews on Naver (the Korean portal site) claiming that it was a very heart-warming film (although those can’t be fully trusted as the Korean movie industry is known for paying off the reviewers on sites like those). One phrase to summarize the movie <Happy Together>: Cringe to the MAX. I utterly hate movies like this. This is just a personal preference, so please don’t take my words as an absolute, but there were moments, and A LOT of them, that were way too corny. Yes, there were a few that presented “chuckle moments,” but no LOL ones. The movie is categorized as being a “comedy/drama,” but I wouldn’t consider it to be a comedic film. It had me crinkling up my fingers at all the cringe it had. From the start till its final scene, the movie was filled with cheesy, corny scenes. Moreover, the film had as much forced tear-jerking as it had cringe. It felt like the ultimate goal of the movie was to get the audience to cry; and not just once, but like a thousand times! Why? Why is that necessary? It was trying way too hard that I felt sorry for the child actor that had to cry every 10 minutes. There were sad scenes after sad scenes, after sad scenes. This is something I despise in drama-films… You shouldn’t have to try and go out of your way to make the audience cry. If the story is good and the audience is able to engage with it, the tears will naturally follow. As I mentioned above, the overall story of <Happy Together> was decent. However, it makes me wonder how realistic it is. I mean, the relationship the father and son have is great, but how realistic is that? It just felt too much of a fairy tale story. The story was good for like the first 15 minutes, and then the movie just completely falls apart. And if you were looking forward to “Hyuk” from the Kpop group “VIXX” in this, you’ll probably be disappointed. Not necessarily because of his acting, but the lack of it. He’s in like the first 5 minutes of the film, and then doesn’t appear again until like the last 5 minutes. He’s hardly a “main cast member,” but more of a supporting one. It’s unfortunate that he didn’t have more opportunity to show his potential. And lastly, the film had a few logical fallacies. One, for example, was the fact that in the last scene where Haneul (Hyuk) is performing, the audience is all seated in fixed chairs like that of a musical theater, but in the next scene, people are jumping around dancing in a standing area, with no chairs to be seen, like that of a hip-hop concert. No, it can’t be that the people that were sitting just stood up; the theater where the performance took place was like an opera-house theater, where the theater is filled with secured seats that cannot be removed. Some may say I don’t have a heart for not liking this movie, but this was just cringe at another level. If you liked this, then you probably haven’t seen a genuinely well-made sad movie. <Happy Together> was extremely corny, and tried way too hard to make the audience cry. To be completely honest, I wanted to walk out midway through. I definitely do not recommend.